The traditional period in the northern hemisphere for the Week of Prayer for Christian Unity is 18-25 January. Those dates were proposed in 1908 by Paul Wattson to cover the original days of the feasts of the Chair of St. Peter (January 18) and the Conversion of St. Paul (January 25) , and therefore have a symbolic significance. In Chicago a special event is to be held on January 25 in Hyde Park. 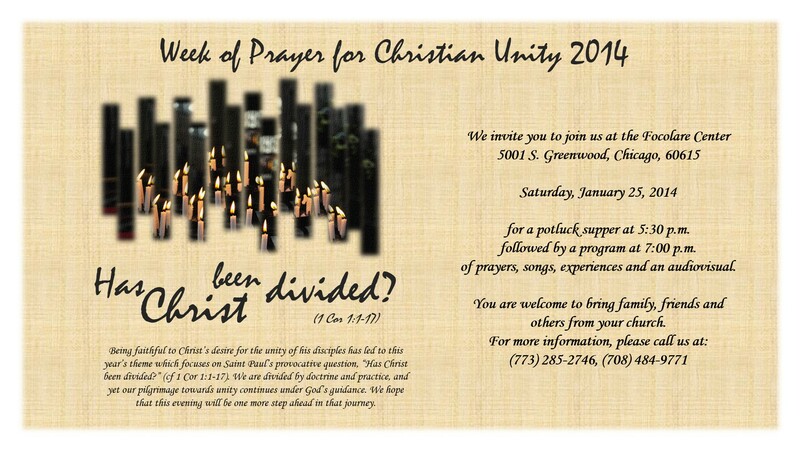 I encourage all friends of Christian unity to join me this year, on Saturday, January 25, at 7:00 p.m.